Emma joined The Mews in May 2013. 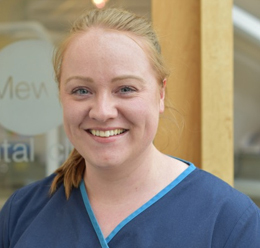 She previously worked in NHS and Private Practices in Oxford and Devon after having gained her National Certificate in Dental Nursing in 2010. Emma enjoys nursing as well as the administrative side of the job as it provides a varied and challenging work environment. In her spare time Emma likes getting out and about in the countryside, going travelling and cooking and enjoying good food.